If you are like many Grand Lake area homeowners, a sprinkler systems is the most convenient way to keep your property looking green and beautiful in the long, hot Oklahoma summers. And it’s especially convenient for lakefront homeowners who can – with proper permitting from GRDA – pump water directly out of Grand Lake for their irrigation needs. As with anything, though, you want to make sure you are working with a local irrigation professional who knows what they are doing and has done it before in the Grand Lake area. Whether you have a residential or commercial project in the Grand Lake area, our experienced lawn care and landscape professionals find no task too tough to tackle with the highest quality of workmanship you will find. The bottom line is that if it has to do with your lawn or landscaping – R & D Lawn Care & Landscaping can handle it! Remember, lawn care that is extensive doesn’t have to be expensive. Call us today for all of your Grand Lake area lawn care and landscape needs at (417) 438-6590. Affordable Irrigation is Tulsa’s #1 rated irrigation company and we are excited to be bringing our excellent service and reputation to the Grand Lake community. You folks in the Grand Lake area can expect top-notch customer service and answers for all of your irrigation questions and concerns. We know your time is valuable and that is why we arrive on time for your sprinkler system estimates, new irrigation system installations, and sprinkler system repair appointments. And we will install your new sprinkler system on the day it is scheduled – barring any unforeseen circumstances like nasty weather or other things outside of our control. And if that happens, you will hear from us immediately. So whether you are in the market for a brand new irrigation sprinkler system or just in need of repair and maintenance on an existing sprinkler system, give us at Affordable Irrigation a call today at (918) 550-8099 so we can answer your questions and get started on your project. And don’t forget, we can also handle all of your landscape lighting needs as well! Hey, we all love rolling up to our Grand Lake home with the yard looking lush in the middle of the summer. And when working with a quality Grand Lake lawn care company, you can rest easy knowing your yard and grounds are well kept throughout the year. But sprinkler installation is more than just laying down some pipes and connecting heads at strategic spots. Professional sprinkler installations focus on making the most of your sprinkler head coverage, making sure there is adequate pressure, and using strategies that maximize your sprinkler coverage while minimizing the amount of water used. Of course, once you have a sprinkler system, then sprinkler system repair becomes something you need to worry about as well. Irrigation system problems can include blocked sprinkler heads, low pressure and the need to winterize your sprinkler system given the freezing temperatures we get every year around Grand Lake in the winter time. 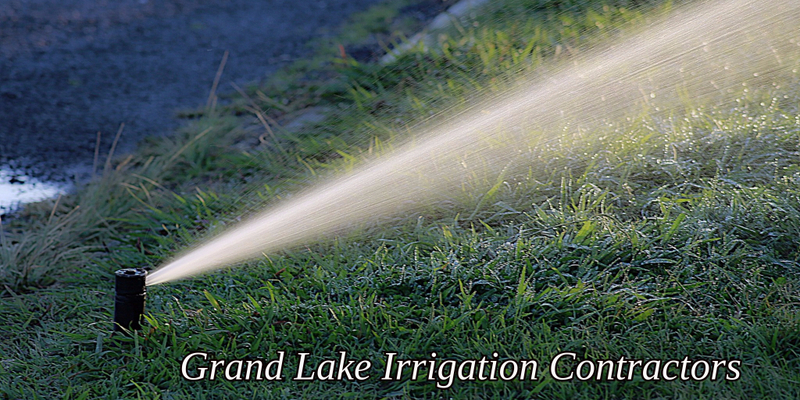 As always, just make sure you have done your homework and are hiring a Grand Lake irrigation contractor that can take care of your sprinkler system all year, so you can rest easy and enjoy your yard, and your Grand Lake Living, you around.